Grab Award-Winning Blueair Quality Air Purification at a Discount with This Refurbished Unit! Here We Offer a Powerful Portable Large Room Air Cleaner that Silently Removes Odor, Chemicals, Smoke, Dust, Mold, Cat, Dog or Other Pet Dander, Hair & Other Particles in Any Home or Office up to 700 Square Feet and Includes a 5 Year Limited Warranty, Remote and Automatic Sensors, All at a Cheap Price with Free Shipping! Remove dust, smoke, odors, pet hair and dander from large rooms and offices with the best allergy and asthma reducing portable electronic air cleaner unit. This classic refurbished unit offers your best value with automated digital indoor particle & odor sensor system, remote control, AHAM certification for 698 sq ft & has top-ratings for home use. The E-series features an electronic system that continuously monitors and purifies your air using integrated sensors and an automatic fan control. All you have to do is set the unit to "Auto" mode and it will purify the air anytime it senses airborne pollutants. 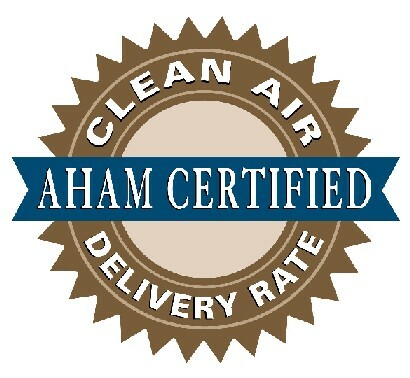 The digital display even indicates the moment-by-moment status of your indoor air quality. Wow! 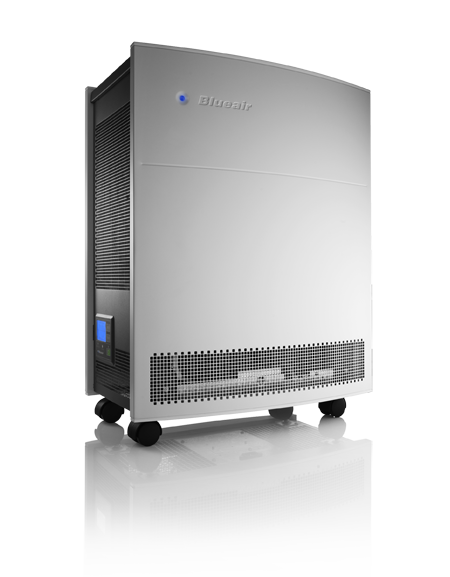 The BLUEAIR 650E comes standard with a powerful HEPA particle filter that removes 99.97% of all troublesome airborne particles commonly found in homes and office spaces--dust, dust mites, mold spores, pet dander, bacteria, viruses. With the optional GO SmokeStop Filter, the 650E will also remove gas, smoke, odor control for large bedrooms, kitchens, living rooms, offices, or any space where cigar or cigarette smoke is an issue. Also very good for removing mold spores and chemicals/toxins released by mold. Also one of the best air purifiers for pets / pet odors! The activated carbon in the Gas & Odor SmokeStop filter is impregnated with a 70/30 blend of Potassium Hydroxide (KOH) and Potassium Iodide (KI) for bonding/trapping chemicals / VOC's in the air, which contribute to odors. etc. The GO SmokeStop filter is the perfect filter choice for those who need relief from particle-induced allergies and headaches, eye/nose/throat irritation from airborne chemicals, smoke, and odors. Removes 5 times more dirt than many other air purifier brands. How It Works: The BLUEAIR 650E Air Purifier takes air in through one side of the unit, passes it through the pre-filter where larger particles are trapped, then through an electrostatic HEPA-type filter to trap smaller particles, then through the activated carbon filter to remove chemcals, odors, etc. Then, the air is passed through an ionization chamber where the air mixes with negative ions. Negative ions are then released with the clean air through the opposite side of the unit. These ions (only healthy negative ions) collide with the remaining particles in the room air and the particles become charged. When the air cycles back through the unit, the charged particles are trapped by the electrostatic filter media. The result: 99.97% filtration efficiency for all particles down to 0.1 microns, and with the GO SmokeStop Filter, air that is 99.97% free of chemicals, odors, and smoke, as well.